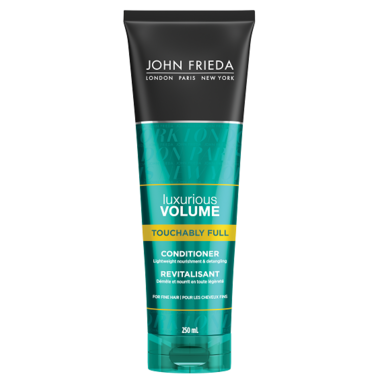 John Frieda Luxurious Volume Touchably Full Body Conditioner weightlessly detangles for volume that looks and feels natural. The patented formula weightlessly conditions and detangles, applies volume building technology to the hair, then rinses clean. During blow drying, this specialized technology is activated to enhance fullness and boost volume. The result is hair that looks naturally full and shiny, and feels touchably soft. Ingredients: Aqua, Sodium Laureth Sulfate, Cocamidopropyl Betaine, Cocamide MEA, Sodium Chloride, Parfum, Polyquaternium-7, Benzyl Alcohol, Disodium EDTA, Silicone Quaternium-18, Laureth-16, Malic Acid, Polyquaternium-52, Trideceth-6, Glycine, PEG12 Dimethicone, Trideceth-12, Caffeine, PPG-9, Maris Sal, Alcohol Denat., AMP-Isostearoyl Hydrolyzed Wheat Protein, Methylchloroisothiazolinone, Methylisothiazolinone, Sodium Hydroxide.